This magnificently beautiful diamond bracelet is astonishing! It is custom made from top to bottom and is created in such an exceptionally beautiful design. It features a mix of larger fancy shape diamonds in the center like emerald cuts and marquise and they are each surrounded by a row of round diamonds. 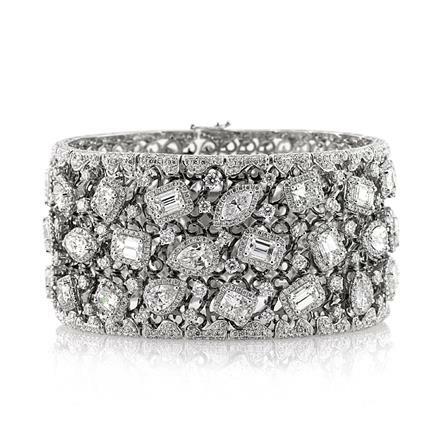 The top and bottom of the bracelet is studded with round diamonds as well. It has such an amazing combination. It is one in a million! It will take your breath away. Trade-in and trade-up to shine more than ever. We can customize any piece around your existing diamond. We purchase a wide variety of diamonds.